Nickname: "Tiger" -- given him by his dad, in honor of his dad's South Vietnamese combat buddy, Nguyen Phong, who saved Tiger's father's life in the Vietnam War. Home: Orlando, Florida. Tiger lives in Isleworth, a development on the west side of Orlando. As a Role Model: Tiger thinks that being a good role model to others is even more important than his golf. He thinks his golf is just a vehicle for him to influence people. He wants to influence kids in a positive way. Tiger feels that's what it's all about. Tiger and his parents put together The Tiger Woods Foundation in order to promote both golf and non-sports activities for disadvantaged children. 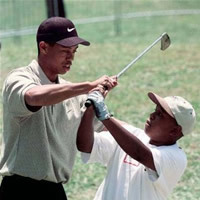 In 1997 Tiger ran six different golf clinics for youths in Orlando, Chicago, New York, Dallas, Miami and Memphis. Tiger's foundation isn't just interested in helping kids with their golf. It's to help youngsters become better people. People say Tiger has a real presence and that his ability to help others extends beyond the U.S. He is truly a multi-racial person, not just a black athlete. People feel that he will be a big influence on people across the world - and not just in a golf sense. He can hold everything together. He is a universal child - truly multi-cultural. Father: Earl Woods was a lieutenant colonel in the Army and a former Green Beret. He served two tours of duty in Vietnam. Earl Woods passed away May 3, 2006. Mother: Kultida (Tida) Woods. Her maiden name is Kultida Punsawad. Parents met: in Bangkok, Thailand, and were married in 1969. Ethnic background: African, Thai, Chinese, American Indian, and European. Religion: Buddhism, his mother's religion. Tiger says that his religion has given him self awareness. He says his religion has taught him that he is here to work on flaws in his personality. The two things he has worked on most has been stubbornness and impatience - he used to want things to be perfect right away. Now he understands that he has to work on things in his life and that this takes time and discipline. Biggest Influences: Tiger's dad, who saw him through almost every phase of his golf development. His dad used to sit by Tiger's bed at night and give him confidence, telling him how good he was going to be at life and at golf. But his dad never pushed him. Tiger did what he did because he wanted to. The other big influence in his life was his mother. For years she used to get up early in the morning and drive him to tournament sites all around the state of California. She used to keep score and never complain about how much time it all took. He says they were both very important in the development of his golf. Early beginnings: Tiger started swinging a sawed off golf club in his garage at 11 months. College Education: Stanford University, Palo Alto, California where he majored in economics, and played collegiate golf. Siblings: Tiger has 2 half brothers and 1 half sister from his father's first marriage. Early Golf History: Tiger was undefeated in 30 Southern California junior golf events. He won the U.S. Amateur at the age of 18 in 1994. He was the youngest to ever win this event. He is the only golfer to ever win three U.S. Amateurs in succession. Professional Status: Tiger became a pro golfer in August, 1996. In that year he played in eight official PGA Tour events, and won two of them. Tiger won $790,594. and finished 24th on the final 1996 money list for pro golfers. Biggest Contracts: Tiger signed a 40 million dollar contract with Nike, and a 30 million dollar contract with American Express. First professional win: The 1996 Las Vegas Invitational. He won $297,000. Quote about Tiger: Sports star Michael Jordan says: Tiger... will succeed and expand across all racial barriers.... I admire him... for establishing a new plateau, a higher ground, if you will.... I really do believe he was put here for a bigger reason than just to play golf. I don't think that he is a god, but I do believe that he was sent by One." Fan mail address: Attention: Tiger Woods, International Management Group, One Erieview Plaza, Suite #1300, Cleveland, OH 44114.